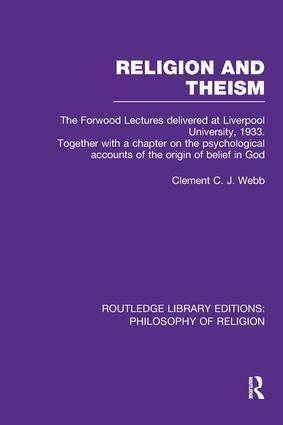 Four lectures on the Philosophy of Religion are included in this compact book along with an extra chapter on the psychology of belief in God. In a search for an acceptable theism, the author examines religious faith and human personality via many theories and facets of thinking, referring to psychologists, theologians and philosophers who have battled with similar questions. Originally published a year after the lectures were presented, this is an interesting classic volume by a well-known theorist of the early Twentieth Century.